When confronted with a work by David LaChapelle, one experiences a similar enthusiasm as felt by Roland Barthes when in the 30’s in front of a photograph by a young French student, he exclaimed: “ Ah, imagine the suggestive fotogrammes of his existence; visualize a story of symbols” then adding… “What a story!” In photography, the epic of the constructed portrait would appear to be born with the fantastic images by Philippe Halsman of Salvador Dali. There were both myth and legend behind these impressive photographs, which circulated around the world within a few weeks. It was 1948 when a photographic portrait was usually a prefigured studied pose, a shaded grey background, two lateral lights and a nice close-up frame, or half-bust at the very most. Suddenly into creative arena strides a young photographer of Lithuanian decent who distorts the space and time of the pose (the anti-pose even). Everything within the studio begins to move as if by magic: the lights reproduce themselves. They are no longer trained only on the face of the subject; the photographic sessions lengthen to hours at a time, sometimes even to days. Halsman wanted to make the scene richer and even has objects custom-made. He added assistant to help coordinate the shoot; everything happened in a thirtieth of a second: 20 liters of water are thrown form the left, three terrorized cats leap into the air towards the ceiling while a chair flies up to the height of a man. After hours and hours of trails, finally the masterpiece is achieved: Dali Atomic. 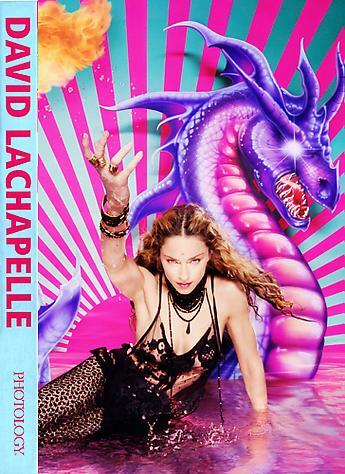 David LaChapelle is as “atomicus” as both Halsman and Dali put together.